Renewals account for over half of the company’s premium revenue in H2 2018. Radix premiums generated about $1.35 million in retail revenue during the second half of 2018. New top level domain name company Radix had a strong finish to 2018 when it comes to premium domain name sales. The registry estimates about $1.355 million in revenue from both recurring premium fees and one-time premium fees on its portfolio of domain names. This number considers the retail prices paid. Renewals accounted for more than half of this. 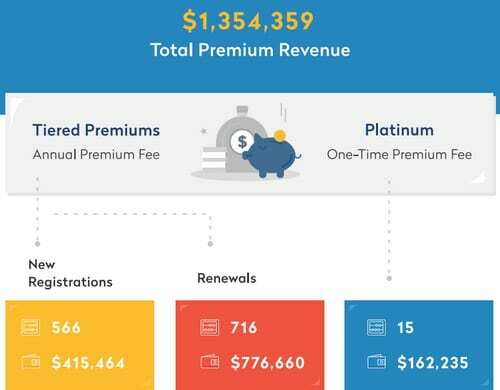 716 premium renewals generated approximately $777k. 566 new registrations generated about $415k. The company also sold 15 domains with one-time premium fees to generate $162k. Top sales with recurring premium fees include house.store for $16,875, water.tech for $15,000 and edu.online for $10,700. Top sales with one-time premiums include design.online for $57,500, air.space for $17,500 and king.online for $17,250. .Online and .Tech were top sellers. Each generated over $100,000 in retail revenue. 51% of premium domains are renewed on their first anniversary and 76% after that. 41% of renewed premium domains are being used. I’m actually surprised this number isn’t higher given the high cost to renew, but keep in mind that not all premiums have high renewal fees. For example, the average price of new premium .website registrations is only $295. This says a great deal about how much COM prices could raise and have no significant affect on COM registration rates.